Flames roar after a refinery plant explosion in Wisconsin where at least 11 people suffered injuries and forced an evacuation of the surrounding area. An evacuation order lifted Friday in northwest Wisconsin after a refinery plant explosion and fire injured at least 11 people and sent billowing plumes of black smoke into the air. The refinery site is now safe and stable, and that the air quality is normal, said Superior Mayor Jim Paine. He lifted the evacuation order just before 6 a.m. The Husky Energy oil refinery was extinguished late Thursday, fire officials said. However, the evacuation order remained overnight for Superior, a city of about 27,000 residents that shares a Lake Superior shipping port with nearby Duluth, Minnesota. 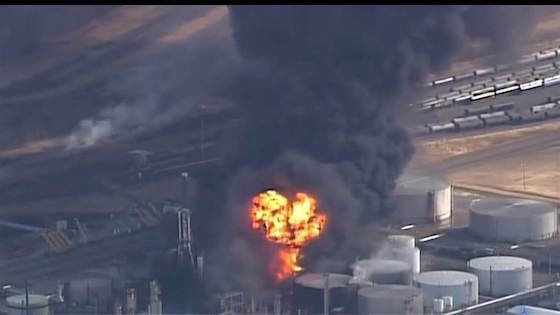 A tank of crude oil or asphalt exploded about 10 a.m. Thursday at the refinery, prompting authorities to order the evacuation of a 3-mile radius around the refinery, as well as a 10-mile corridor south of it where the smoke was headed. It was unclear how many people evacuated, but Paine said most of the city was affected. The refinery is in an industrial area, but there’s a residential neighborhood within a mile to the northeast. The corridor downwind to the south of the refinery is sparsely populated. Schools in Superior and nearby Maple, Wisconsin, canceled classes Friday as a precaution. Thick, black smoke that could be seen for miles poured from the refinery hours after the explosion. Refinery manager Kollin Schade said the smoke was from burning asphalt that was so hot firefighters were unable to attack the fire to try to put it out. Emergency officials later said another tank had caught fire, too, though they didn’t specify what was in it. A four-person team from the U.S. Chemical Safety Board will investigate the blast. The fire was initially put out about 11:20 a.m. Thursday, but it reignited, prompting police to urge residents living within an evacuation area to leave. Police blocked roads into the area around the refinery. Three schools and St. Mary’s Hospital in Superior evacuated as a precaution. A contractor who was inside the building said the explosion sounded like “a sonic boom” and it happened when crews were working on shutting the plant down for repairs. Calgary, Alberta-based Husky Energy bought the refinery from Indianapolis-based Calumet Specialty Products Partners last year for over $490 million. It is Wisconsin’s only refinery, and it produces gasoline, asphalt and other products. The refinery was fined by federal officials under its previous owners in 2015. U.S. Department of Labor spokesman Scott Allen said the Occupational Safety and Health Administration fined Calumet Superior LLC $21,000 over emergency response and flammable liquids violations. The violations were settled and the problems resolved by the end of that year. The refinery, which started up in the early 1950s, has a processing capacity of around 50,000 barrels per day and a storage capacity of 3.6 million barrels of crude and products. It processes heavy crude from the Canadian tar sands in Alberta and lighter North Dakota Bakken crude.